The Igloo Iceless Thermoelectric Cooler is optimized for on- the – go usage, as it does not require ice, but rather cools itself via thermoelectric tech powered by the cigarette lighter in a car. This unit is ideal for long trips as there is no mess from melting ice and no need to refresh the ice in a cooler, as this cooler can stay cold anytime and anywhere as long as it is plugged in. Side handles that are molded-in to the cooler. 8’ long power cord that can be plugged into any 12V DC port (ex. a car cigarette lighter)—can also be plugged into a standard outlet using an adapter that is available for purchase. The cooler is 26 quarts and 9 pounds. Cools to 36 degrees cooler than the outside temperature. Ultimately, the Igloo Iceless Thermoelectric Cooler offers an innovative technological solution to the problem of transporting cold food or drinks over long periods of time—melting ice causes a huge mess, has to be frequently refilled, and is very heavy. The majority of reviewers love the Igloo cooler, even giving it a five start review due to the convenience—the cooler is portable, quiet, and self- sufficient. 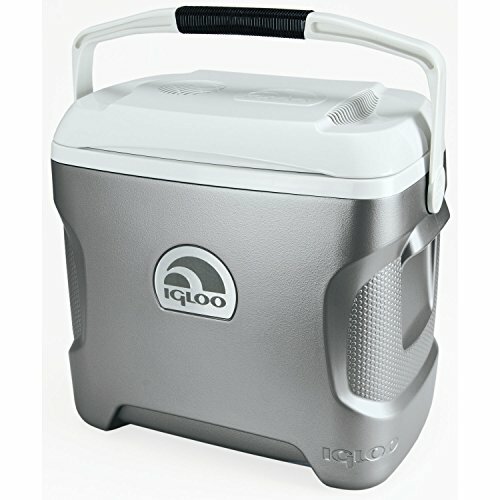 Despite the overall positivity surrounding the Igloo Iceless Thermoelectric Cooler, one of the main complaints associated with this Igloo product is that the wall adapter needed to charge the cooler anywhere other than a car, is not included in the cooler purchase, but rather must be purchased separately. This unit could be a good choice for those who are on the road often and wish to bring food or drinks along with them. The optimal use scenario would not be extremely hot temperatures, as the cooling functionality is limited to 36 degrees below the outside temperature. The brushless motor and the convection cooling ensure that all the items in the Igloo Iceless Thermoelectric Cooler cooler stay cold, not just some of them. An adapter cord can be used to plug the cooler into a regular outlet—this is ideal for traveling, as the cooler can be brought inside and kept cool even when the car is turned off. The noise of the fan cooling the unit is not overly loud, users have described the sound level of a small home fan. Runs constantly to keep things cool (does not cycle on and off like a refrigerator. Shape is optimal for fitting into the backseat or trunk of a car. Both the top handle and the molded side-handles allow for easy transportation—an important feature as this cooler will likely need to be moved in an out of the car frequently. Customers expressed frustration that the Igloo Iceless Thermoelectric Coolers do not come with wall adapters, as many users have at some point, needed to plug their cooler in a place other than the car. These adapters must be purchased for an additional $40. Nothing can be placed on the cooler as the intake and outtake for the fan cannot be blocked or interfered with. This cooler takes three full hours to get cool once plugged in. Several design aspects have received negative reviews, including a handle easily coming off and a very heavy lid that is difficult to get open. The cooler runs the car battery down if left on for too long (specifically if left on while the car is unattended). The plug to the cooler can get very hot (described by some as overheated) and there have been several reports of melted plugs/cords. There are reports of some coolers breaking within several months of purchase. The cooler will only cool to 36 degrees lower than the outside temperature, which in some very hot climates, may not be as cold as desired. 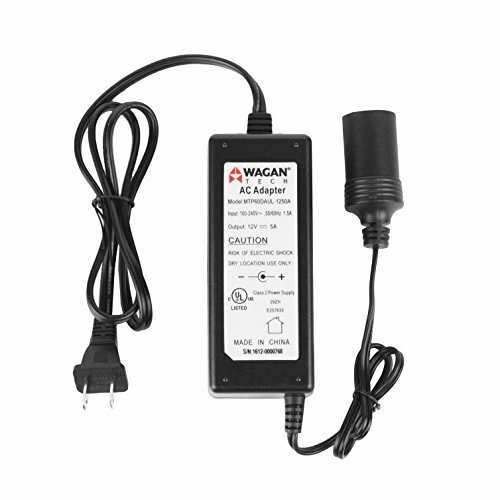 Allows high power 12V DC items to operate on 110v AC power.